The Tax Cuts and Jobs Act (TCJA) is the biggest overhaul of the tax code in more than 30 years. For instance, the TCJA cuts income tax rates for individuals and corporations, doubles the standard deduction, eliminates personal exemptions and repeals or modifies numerous deductions. It will have a major impact in 2018 and beyond. 1. Credit for employer-paid family and medical leave. This is brand new. The TCJA creates a tax credit for wages paid to qualifying employees on family and medical leave. This credit can be as high as 25% of the wages paid. To qualify, an employer must offer at least two weeks of annual paid family and medical leave, as described by the Family and Medical Leave Act (FMLA), to qualified employees. The paid leave must provide at least 50% of the employee’s wages. Qualified individuals are those who have been working for the employer for at least one year, and, in the preceding year, weren’t paid compensation that exceeded 60% of $72,000 (threshold will be indexed for inflation). The credit equals 12.5% of the amount of wages paid during a leave period and tops out at 25%. The credit is increased gradually for payments above 50% of wages paid. No double-dipping: Employers can’t also deduct wages claimed for the credit. Note that the new credit is only available for 2018 and 2019. It could, however, be extended by a future act of Congress. Mass transit passes. This is any pass, token, fare card, voucher or similar item entitling a person to ride free of charge or at a reduced rate on mass transit or in a vehicle seating at least six adults plus the driver if the person operating the vehicle is in the business of transporting persons for pay or hire. Commuter highway vehicle expenses. These vehicles must seat at least six adults plus the driver. There must have been a reasonable expectation that at least 80% of the vehicle mileage would be for transporting employees between their homes and workplaces. Employees also had to occupy at least 50% of the seats (not including the driver’s seat). Qualified parking fees. This benefit covered employer-provided parking for employees on or near the business premises. It also provided fees for parking on or near the location from which employees commuted to work using mass transit, commuter highway vehicles or carpools, such as the parking lot of a train station. A tax-free benefit of up to $20 a month was allowed for bicycle commuting. The TCJA eliminates the tax deduction for these three main transportation benefits beginning in 2018. But the benefits remain tax-free to employees. The tax exclusion for bicycle commuting is repealed. Tax regulations imposed strict recordkeeping requirements for deducting business entertainment expenses. For example, you had to record the time, place and date of the entertainment, the person or people entertained and the business relationships of the parties. Beginning in 2018, this deduction is repealed. However, employers may still deduct 50% of the cost of business meals while traveling away from home. In the past, employers could deduct certain meals provided to employees on the business premises if those meals qualified as a de minimis fringe benefit. For instance, the deduction could be applied to meals furnished while employees worked late hours, as well as food and beverages provided to employees at on-site eating facilities such as a company cafeteria. The value of these benefits was tax-free for employees. An employer could deduct 100% of the cost of these benefits. Under the TCJA, the deduction is reduced to 50% of the cost and is eliminated after 2025. However, the value continues to be tax-free to employees. Previously, if employees qualified under a two-part test involving distance and time, they could deduct their out-of-pocket job-related moving expenses on their personal income tax returns. The deductions were claimed “above-the-line,” so they were available to both those who itemized and those who claimed the standard deduction. Alternatively, employers may have reimbursed employees tax-free for qualified moving expenses. Now, starting in 2018, the TCJA repeals both the moving expense deduction and the tax exclusion except for active duty military personal. Currently, an employer can deduct up to $400 of the value of achievement awards to employees for length of service or safety. The tax exclusion is multiplied by four to $1,600 for awards under a written nondiscriminatory achievement plan. On the receiving end, employees aren’t taxed on the value of the awards that don’t exceed the employer’s deduction. Beginning in 2018, the TCJA clarifies that the tax deduction and corresponding tax exclusion don’t apply to cash, gift coupons or certificates, vacations, meals, lodging, tickets to sporting or theater events, securities and “other similar items.” However, the tax breaks are still available for gift certificates that allow the recipient to select tangible property from a limited range of items preselected by the employer. 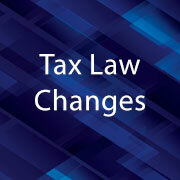 Reminder: This is only an overview of six of the key tax law changes affecting payroll matters. Do you have any questions about the new law’s impact on benefits? Don’t hesitate to contact your payroll providers for more details. Also, certain liberalizations of the hardship distribution safe-harbor rules were contemplated, but eventually skipped by the lawmakers.